make Kitchen Aid standing mixers (roughly $150+) look like kiddie toys. Getting the run of a professional kitchen is empowering for me as I’m a newbie. I consider myself to be a half-way decent home cook with a preference for baking. Looking over the recipes I thought, “I would struggle trying to cook these,” and I was happy that I wasn’t the chef in charge. I was “good” at volunteering because someone was telling me what to do! I started helping my super-organized volunteer partner set up the work stations. Here is the kind of volunteer I aspire to be: always moving, remembering everything, and not making any mistakes. It’s not really a fair comparison considering that my volunteer partner is basically a trained cook. My approach is to try to get as much talk time with the kids as I can. Cooking is social too I tell myself. Anyway, my volunteer partner and I were talking and we, I mean she, realized we needed more cilantro and jalapenos. There are small fridges under the work stations so it is usually not necessary to resupply. But today we needed more. “Let’s go to the walk-in fridge,” she says non-chalantly. Cue scary music. I’m claustrophobic. It’s a phobia that has thankfully decreased in severity as I have aged. I worked in food service in college and so I have walked into big fridges cautiously before. But lockable semi-large walk-in fridges are not something I usually sign up for. Entering the walk-in feels sort-of like going into the county morgue. Brr and scary…now with vegetables! 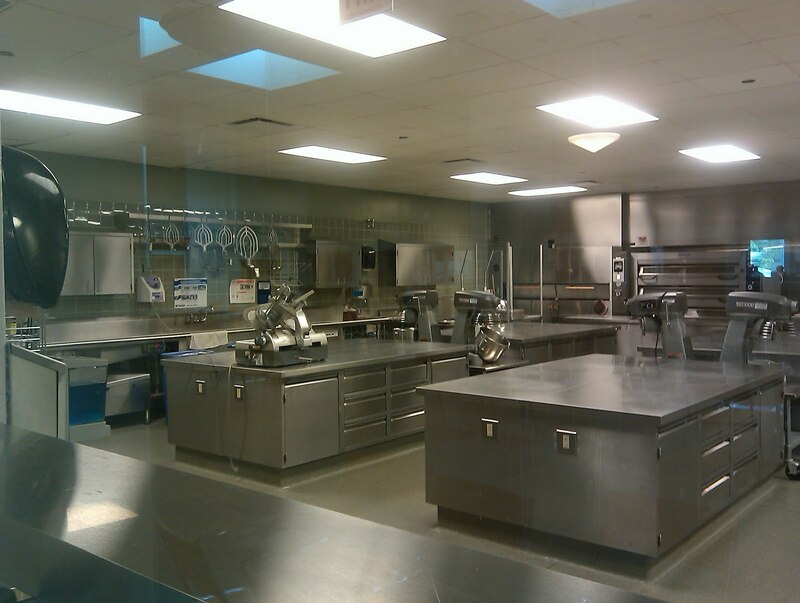 The walk-in was far away from the kitchen stations. We hustled over to it and thankfully it was well lit and narrow not box-like and dark. I was relieved. I still stood in the open door just to make sure it didn’t close after me. I mean, how long can someone even survive in one of those things? I knew that there was little to no traffic over to that part of the kitchen. How quickly would I be an ice cube? Shiver. With our cilantro and jalapenos in hand, we marched back to the area to hear the chef discuss today’s cuisine: Peru! Cool, yet another place I had never visited, but was eager to learn more about. The menu included Seco de Carne (beef stew with cilantro-based sauce), Tacu-tacu (Peruvian rice and lentils), and Cebiche de Atun (Peruvian canned tuna ceviche). Every group was doing all three recipes. During the chef’s lesson, she tells the group that lentils and rice are a “complete protein.” I didn’t know that and I’m sure that was new information for the kids too. I have learned doing this project that basic nutritional knowledge is important. Where are kids going to learn about “complete proteins” if not at school? The chef also had a beach ball globe, which she used during lessons to point out the location of countries whose cuisine was prepared, cooked, and eaten. The chef also showed the students the beef, its grain, and how to cut it. I thought it was a great lesson and the kids paid great attention as they crowded around the station. After the lesson we broke out into our groups. Nobody wanted to chop onions today. One girl volunteered to chop the jalapenos. We cautioned her to be careful and not to touch her face or eyes. She de-seeded them and diced like a pro albeit at a slower rate than a trained chef. One student in my group said, “I don’t like tuna.” But she was willing to open the can and do much of the preparation for the dish. My favorite dish from this grouping was the tuna ceviche. Earlier this summer I shared that I really enjoy tuna. The recipe for canned tuna ceviche is really a great way to make a whole different kind of tuna for a sandwich for lunch. The recipe called for onions, jalapenos, cilantro, a tomato, lime juice and olive oil. Basically you stir it all together and then serve it. The camp counselor explained to her students that this was a great way to do a whole different kind of tuna salad without mayo. My husband does not like mayo and I made a mental note to try this with him. I was surprised how much the kids like their food with spice. They showed no fear of jalapenos. No wonder these kids get bored with regular school lunches. Processed food cannot compete with the pow of good seasonings and the occasional jalapeno. The rice and lentils are cooked ahead of time so that the kids can focus on prep and working at the stove. The chopping and the cooking went well and quickly. The cooking went fast today, but I attribute that to my spectacular volunteer partner. The rice and lentils were precooked so after the chopping was completed, stove top cooking was all that was left. The kids set up the little bowls and plates and everyone got to have some of the tasty food. The trio of dishes was popular with the kids as they devoured everything. And just like that the afternoon was over! I got a couple questions about why I didn’t photograph the food. We were working together in a large commercial kitchen. Everyone had clean hands for food preparation. If I had ducked away to the far side of the room to find my cell phone in my purse and then come back and tried to take a picture that would have been very odd. Trust me that the food was colorful, hot and just plain delicious. Do not be afraid of the walk in fridge, I have been in several and they all have a saftey feature that makes it impossible to be locked inside. When it gets too hot in the kitchen the walk in fridge is like walking into the artic and it is so refreshing. I think this group sounds really great. Tuna ceviche might be something I could try with my daughter. She's expanding her palate lately, plus she already likes tuna and doesn't like mayo. I'm also a bit jealous, lol! All the kid's cooking classes I've found around here are ones that "cook" (assemble) things I don't particularly want my kids eating on a regular basis. They seem to usually focus on sweets. Yeah. I have no problem getting my kids to eat sweets (snort! ), why would I want to pay for them to go to a class and make them? lentils and rice! something I ate a lot of in college. Very inexpensive and a complete protein. Add some veggies and it is even better. It even tastes good cold. Well, it tastes good cold to me. You can spice it up too, tastes great with curry spices and peppers or milder. I've never had ceviche. It is usually made with raw fresh fish. Really fresh fish, just caught that morning fresh. Never thought to use canned tuna. I may have to try that mock ceviche. I'm enjoying your adventures. I think you learned just as much as the kids. I think it opened your eyes to more than just the narrow school lunch problem, but still went well with your theme of kids and food. I do find it interesting that you have so few comments when the post is so positive that there is nothing to complain about. Are you enjoying this lull or do you find it disconcerting that you have to be controversial in order to get comments? Is there a counter that shows how many people actually read the blog on a daily basis or do you just have to go by how many comments you receive? Viki – I think it's quite weird that there have been such few comments! I'm enjoying this "lull" tremendously though. In fact, I'm thinking I need to take an actual "bloggy break" before school starts. Do you have any theories as to why there are fewer comments than before? Is it that this series is so positive and non-controversial? I'm still getting consistent, decent traffic to the blog so people are reading it. But not extra high traffic (the McDonald's post for example). Things have slowed down over the summer too. Thanks fo asking. after I have a Bear Claw for my morning pastry. Damn you Mrs. Q and your hunger-inducing posts!! Get back to photographing those unappetizing school lunches, fast! When there is something negative, there is something to comment on. When there is something so positive as Common Threads…Why comment on something when we all agree, it is a great program, there needs to be more like it. Too bad all kids can't have something positive like this….and so on. Not much else to say. Except to talk about the food that is prepared. Tomorrow or Saturday I hope you sum up what it has done for you to work with this program, what it might mean for you in the future. How it has changed you and the way you think about food, yourself, the world…how you could bring a bit of this into your classroom. I'm an American born Peruvian, so it's nice for me to read that this cuisine was being prepared. I've only been there once, when I was 4-1/2, and I have few memories. But I hope to go back there one day and experience it as an adult. Yes, lentils are great, I make them pretty regularly since they are so nutritious and my daughter and I really enjoy them. I often add finely chopped veggies when I make them so they can be more of a balanced meal. Do have to say for a Peruivan, I do not like heat, but do love lots of flavor, so I am trying to slowly add more and more heat to my food. Both so I can enjoy more foods, but also so my children can get accustomed to it and will enjoy both flavor and heat in their foods. Currently my two kids love flavor, but together we are learning to tolerate more of the heat from peppers. BTW, although it's true that no single plant food contains all the amino acids, you don't have to combine them at the same meal to get "complete protein" (a major tenet of vegetarian diets in the 70s and 80s). All you have to do is make sure you're eating a variety of foods each day, and your body will do the chemistry and get what it needs. That said, lentils and rice are a yummy combination! Almost any legume combined with a grain will be a complete protein, which is why people who can't afford to eat a lot of meat can survive. Look at peasant food in almost any country in the world–rice and beans, lentils and rice, taro, peanuts, soy… The human body is an amazing thing, and plants are incredibly diverse in their nutritional offerings. I will share the rice+lentils idea for a cheap protein idea with my young adult kids who are striving to maintain their budgets. And use it more myself too (and make it more often for them) as well, since it is yummy. I looked up the complete protein concept since I thought I had read that quinoa is one of the few complete proteins by itself. It seems so, according to this wikipedia article: http://en.wikipedia.org/wiki/Quinoa. Need more sources. While wikipedia isn't always the end-all source, in this case it does appear un-contested. peanut butter on whole wheat = legume+grain = whole protein! maybe you are getting fewer comments because it is summertime and people are on vacation?